Today, almost every elite athlete has conducted some sort of performance test. Even amateur runners and joggers are beginning to conduct performance tests at sport clinics in hopes of being able to "adjust" their training according to the test results. Through the improvement of their training, they also hope to improve their overall athletic performance. The best test you can conduct in order to measure or judge your endurance is the VO2max (the maximum amount of oxygen in milliliters your body can use in one minute per kilogram of body weight) test. The measuring of oxygen delivery is only possible with expensive, extensive and precise equipment. Other, simpler tests, however, will suffice for your training. During a lactate threshold test, an athlete runs on a treadmill or bike and the speed is gradually increased in stages and lactate is then measured by taking a drop of blood from either the finger or the ear between stages. It is important to note that about 6 minutes is needed for each stage in order to reach and measure the actual lactic acid level (in it’s steady state). Therefore, a test with shorter stages, is questionable. A more detailed description of this test can be found here. Conducting a Conconi test is a scientific method to find your anaerobic threshold to find out what sort of training is optimal. This test is one of the easiest to conduct. Because in reality, who can really get their VO2max and a lactate threshold tested all at once? Most runners these days run with a heart rate monitor. This way, one’s training can be steered in the right direction or can aid in training. The Conconitest is not the most practical test if one wants to run the marathon because the testing stages are too short. Most top runners do not even do the general lactate threshold test. They know their racing pace so well that they would rather do test runs of 20 to 60 minutes at estimated racing pace. During this test their lactic acid levels, heart rate and perceived exertion will be measured on the Borg Scale. Through the value comparison of this test run with earlier test runs, they can decide if they are able to keep up their target pace. The different possible performance tests are not just a matter of belief or trust. 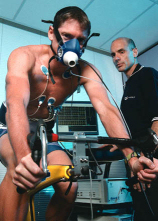 You can become an elite athlete without having conducted any of these performance tests. However, you can record the results from your lactate threshold tests on VICSYSTEM. The test results will then influence the development of your training plan. However, these performance tests are not required to be able to train with VICSYSTEM.